At Pancreatic Cancer Action, our goal is to ensure that more patients are diagnosed with pancreatic cancer at an early stage so that they have the best chance of survival. 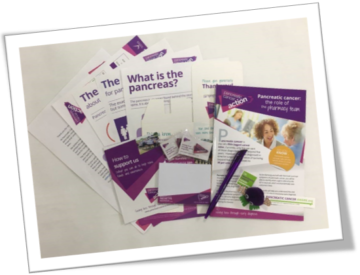 We know that raising awareness of pancreatic cancer and its signs and symptoms can save lives. One way we aim to achieve this goal is by raising awareness amongst the medical community, more specifically: GPs and pharmacists. You can help us to achieve this by talking to your local GP practice about pancreatic cancer and by letting them know about our free e-learning module for GPs. We can provide materials to help you do this. Order your GP awareness pack to take into your local GP surgery today! One of PCA’s key objectives is to offer free education to primary care professionals. Order your Pharmacy Awareness Pack today and spread the word with your pharmacy team!